Division of Wildlife game managers are asking Coloradoans and vacationers alike to take extra care to avoid attracting hungry bears to homes, cabins, campgrounds and picnic areas. Within the last week, wildlife officers were forced to kill three bears that raided homes and refused to leave, even after being struck in the flank by a load of non-lethal rubber buckshot. A poor crop of natural food that began with last spring's dry spell has continued in some areas. And with prime feeding time for bears just ahead, wildlife managers are concerned that the number of people/bear encounters could increase. "When we have dry years like this, the bears have to look harder for food, and in doing so often end up finding what people leave out - garbage, bird feeders, barbecue grills and other human food," said Tina Jungwirth, the Division's district wildlife manager in Boulder. Division bear researcher Tom Beck said habitat conditions this spring could lead to more bear problems. "The early greenup of plants bears depend on in early summer means there's less natural forage in some areas," he said. "The biggest problem we're going to face is in areas where bear habitat is marginal, such as the northern Front Range and the high mountain parks." But given the conditions in some areas, Beck said he's surprised Colorado hasn't had more people/bear encounters. "We've dodged the bullet in some areas so far," he said. In Summit County, District Wildlife Manager Tom Kroening has received complaints about eight to 10 bears and is working nights and weekends in an effort to keep up with the hungry bruins. "One bear went in three houses in three hours and showed no fear of people," Kroening said. The bear even broke windows in a home as people ate their dinner inside. A blast of rubber buckshot barely backed the bear off, and with the bruin presenting a threat to human safety, Kroening had no choice except to destroy the bear, one of two he had to kill. Like other wildlife officers, Kroening works to avoid killing bears. It was the first bear he's had to kill in three years. District Wildlife Manager Jim Aragon had to shoot a large male bear near Trinidad last week that also refused to be dissuaded by rubber buckshot and spent six hours rummaging through one home. The bear had torn through a screen of an open window to gain entry. Like other wildlife managers, Aragon shoots bears only as a last resort. But Aragon and other wildlife managers have a never-ending job educating people about bears. "There are so many houses going up in the backcountry that we are running out of places to relocate bears to get them away from people," he said. Mark Lamb, the Division's wildlife manager in Park County, spent most of last week working with local residents who reported bear problems. Most residents work with Lamb, but in a few cases, people refuse to take responsibility. In a recent written plea to local residents Lamb wrote: "Please be more responsible about living in bear country. With the influx of new development in Park County, encounters with bears will increase. They will increase even more if you or your neighbors are not responsible enough to care." Al Trujillo, the Division's area wildlife manager in Trinidad, said he and other wildlife managers have had similar experiences. "Most people are pretty good when we inform them about what steps they need to take to avoid bear problems," Trujillo said. "Others are indignant and refuse to make any changes in what they do. "They bring their city habits and just want us to get rid of the bear and they don't care how." The Division of Wildlife directive on human/bear encounters places an emphasis on informing people about the steps they need to take to minimize problems. When wildlife officers receive a complaint about a bear, they first survey the area. "We don't just run out and set a trap every time we get a bear call," Aragon said. "We work with people to educate them about what attracted the bear in the first place and most of the people are very understanding about removing attractants." Game managers become particularly concerned when bears are fed intentionally so a person can get a photo. "There is a law that prohibits intentionally feeding and baiting bears and other big game," Lamb emphasized. "By taking their pictures and watching them, you are teaching bears that it is okay to be near humans." Under state law, there's a $50 fine for anyone convicted of intentionally feeding bears, mountain lions, deer, elk, antelope, mountain goats and bighorn sheep. Lamb urged homeowners to bang pots and pans, blow an air horn or whistle, or make some other noise that might make the bear flee. "It's not too much to ask for people living in bear country to buy secure trash containers, take in bird feeders, and work with neighbors to develop a bear strategy to discourage bears from coming to an area," said Phil Aragon, the district wildlife manager in northern Boulder County. "As long as we have one neighbor feeding bears and the rest of the neighborhood calling the Division to fix the problem, we won't accomplish anything," Aragon said. 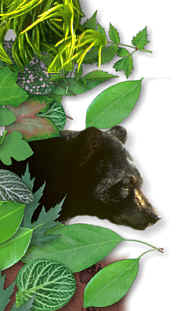 But with rapid growth continuing, Beck said people/bear encounters are likely to grow. "We've got tons of people moving to Colorado and a good number of bears, so even if habitat conditions are good, we're going to have some problems," Beck said. The best solution is to recognize that Colorado is bear country and to learn to live with the bruins as responsibly as we can, he said.